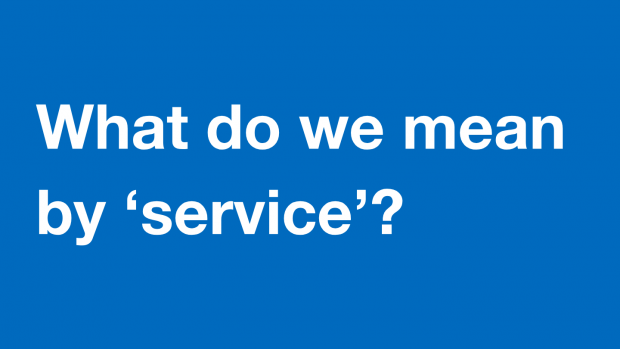 We’ve been carrying out research into how people across government define what a service is. There are a number of reasons for doing this work, including that our thinking about services and the way government works - including its technology and capability - has changed and evolved over the past couple of years. 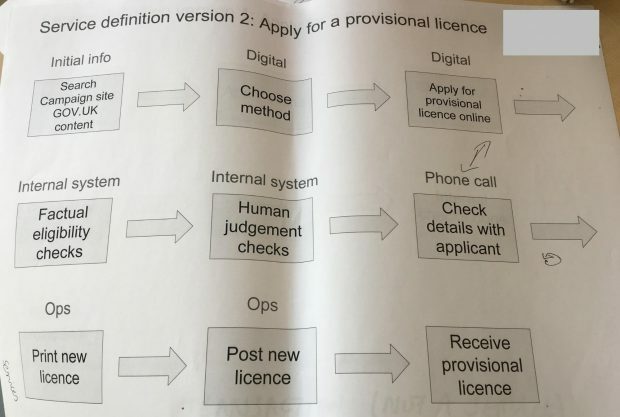 Added to this, we are currently updating the Digital Service Standard to support moving towards delivering whole services as described in the Government Transformation Strategy. Because of all these changes and having reviewed existing research, we had a hunch that the definition of 'service' was unclear across government. how do we define a service now? 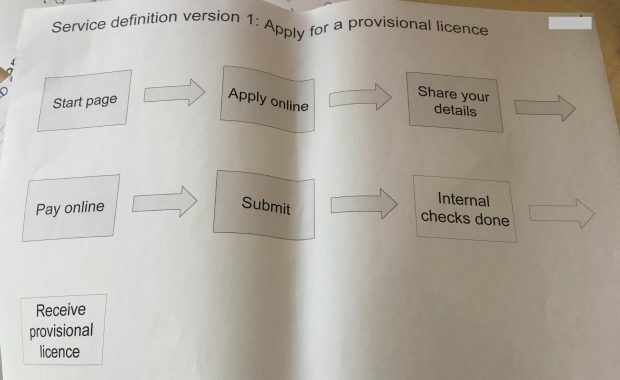 what elements of a service are included in that definition? does our definition of a service vary with context - for example is it different in assessments? We did the research in 2 stages. We started by showing people 3 visual definitions of a service and asked them to either choose one, amend one or to create an entirely new definition that would fit their mental model. An example service was chosen, to avoid talking about theoretical abstracts and ground the conversation in real services that government provides. 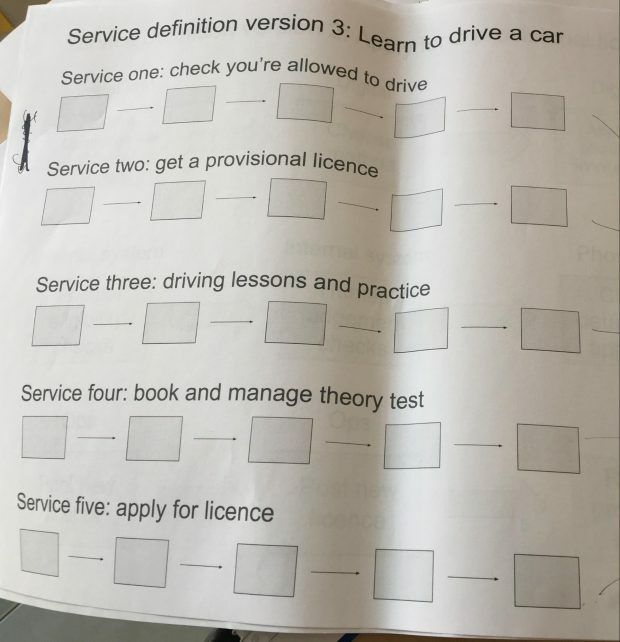 We used applying for a provisional licence - one element of learning to drive. We decided on this methodology to give people somewhere to start, but also allow as much flexibility as possible to make their own definition. Starting with a blank piece of paper and asking people to write or draw a definition of anything is a big ask. When considering something complex as a potential variable of a service, it becomes even more difficult. But we also did not want to make too many assumptions about what people thought a service was. Our hypothesis was that people’s definition of a service could vary depending their experience, expertise and interests. We then did a card sorting exercise (of sorts) to identify the elements people included or excluded in their service definition. For example, do internal systems, calculators, call centres as well the transactional service make up a service? The participants were given some predefined cards and were asked to add cards they thought were missing and sort them into those that were included or excluded from a service. They were also asked to identify elements that could be either included or excluded in a service depending on context. Finally, we asked participants to look at their definition of a service through the lens of assessments - did the definition change or did it remain the same? For this part of the research, we asked the participants to go back to the 3 visual definitions to choose the same or perhaps a different definition for a service for assessments. 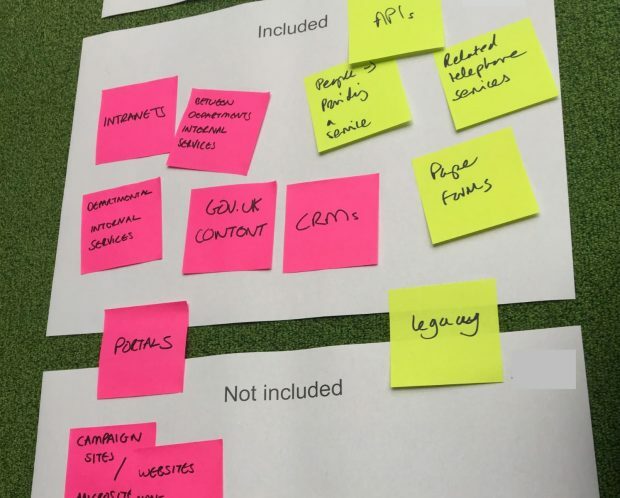 The next step was to take the 3 service definitions to the consultation workshops we ran to get cross-government feedback on updating the Service Standard. We ran a series of 4 workshops across the country which involved 150 people from a range of disciplines. For the service definition research we asked people to use dot voting for their preferred definition of a service and on the elements that make up a service. We also asked people to share feedback where they felt we had got something wrong or missed something. At this stage, we were still uncovering elements of a service we had not considered, as well as consistency or variation between people’s service definitions. How do you research complex definitions? This project was the first time I’d worked on researching the definition of something as complex as a government service. I spent a long time planning how to do this research at the beginning and also made sure I had plenty of time to pilot the chosen method to see if it would give us the insight we needed. What methods have you used to investigate definitions of complex things? Let us know in the comments section.